See how the fabric unravels! Part 1—Saturday: Which is to say, nothing was sewn together! Instead, every piece (fronts, back, yoke, pockets, collar) was edged with an over lock stitch! Two partial spools (one, a 220 yds spool 90% full. The other, about the same yardage) were used up! And nothing was sewn (together), though I did get the darts sewn. The edge stitch— two stitches to left, 2 stitches down, 2 stitches up hill and to the right, (starting point) and 2 stitches forward, 8 stitches, and only 2 moving forward. It is no wonder it ate up thread--(and time!) When sewing seams, a front and back are stitched—but with edging, each edge (one front, one back) needs to be sewn. edge stitch in contrasting color. The coarse even weave (something like Oxford cloth) frays just looking at it, so edge stitching was not an options, but a necessity! I also got the interfacing ironed on (I almost always use non-woven iron on interfacing) So, now that each piece is prepped, sewing up won't take much time at all! Plans for today(Monday) are to spend a little time sewing up the (collar) band. This needs a bit of precision; sewing round the curves, grading the seam allowances, notching, turning and pressing. Nothing very hard, but a little time consuming. Tomorrow or Wednesday, I will get the pocket pieces sewn to the side seams, and other day, I'll get the sleeves hemmed. When Saturday rolls around again, putting all the pieces together will be quick work! Well, quick work except for the button holes. The actual button holes won't take much time or effort (How I LOVE that my sewing machine has this automated!) Measuring and marking, making, cutting, and hand sewing on the buttons—that will take some time-- Because I have changed the neckline, I will likely have to adjust the button placement. Change one detail, and other details need adjusting! That is part of the reason I want to do other little details during the week. Then, come Saturday, I will have enough time for basic assembly, and the detailed button holes, too! After this batch of wardrobe enhancements, I am going to take a break and make some doll clothes—My granddaughters have 18 wanna-be American dolls—time to make some wardrobes for them. I will splurge and buy some fat quarters of velvet, and they will get party dresses, and other fun stuff. I will likely add some purchased shoes and socks, too. I had a similar doll when I was a child, I played with it till I was a young teen. My mother made a few pieces of clothing for her, too. It's a family tradition—My daughter had a “Holly Hobby” doll, (an 18 inch soft/rag doll) I went so far as to crochet lace on the doll underclothes! I became more 'invested” in the doll than she was! Then—another big cutting fest, and more sewing! The yoke sew--the beginning of the end. 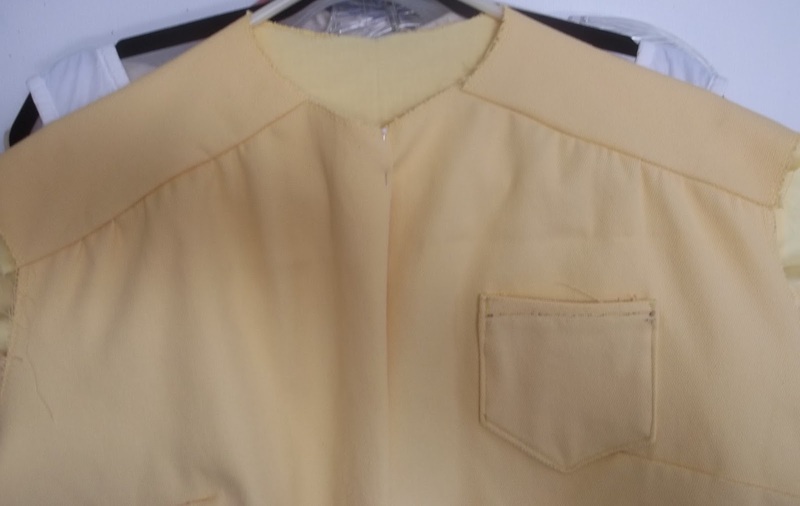 Collar done, pockets attached; sleeves sewn and hemmed—but not attached, A practice buttonhole done, to set up for doing buttonholes. Finally, the fronts and backs were attached at the yoke. Come Saturday again, and all that will be needed is final assembly. Mostly straight seams. Starting with the side seams, with some detailing with the pockets. Then facings and collar; stopping to press the seams before setting in the sleeves, and finishing detail on the collar. I'll press the hem, too, before I attempt to sew, a bit of painstaking worked since the curved edges add a bit of challenge. That will leave the buttonholes-- I always hand sew the buttons on, that my be “while watching TV” project—and might be put off till Sunday. I got some ironing done, too. I like to pre-wash my fabric, especially the cottons, and pre-washing means a spot of ironing. I also had some touch up ironing, too. I am impatient to get the pieces I've cut sewn—First the skirts I think, then the vests, then more cutting! A few sets of doll clothes, and more skirts, and more vests, and another shirt dress. Sort of like washing your hair; shampoo, lather, rinse and repeat! The next time, the shirt dress will have a different collar, (in a contrasting color), for a different look. This will be the third shirt dress in a solid color—a nice navy blue. No shoulder yoke in this version either. A “uniform dress” that is different every time I make it. Typical me—an uniform made from a bunch of different versions! Three identical/not dresses, from last year, one grey with military details, (shoulder yoke, epilaats, pockets with button down flaps, and metallic buttons), two; the current shirt dress with man tailored details, (shoulder yoke, band collar, and shirt tail hem), three; the next one, in navy, no yoke, but a detailed sailor collar, (buttons, top stitching and a neck tie)--and maybe an anchor embroidered on the front. The basics for all three are the same, but the colors, fabric choices, and details make them seem different. Cleaning and organizing along the way, I unearthed some fabric I had forgotten about. So, my plans have expanded—I'll soon have a rainbow array of skirts, some with matching vests, some just color co-ordinates—and few more dresses—in prints and solids alike. I am never sure of my favorite color—i really like the all, but judging by my stash of fabric, BLUE is very popular with me.